I'd hate to be the IT guy fixing this network. 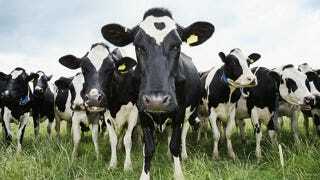 By dropping electronic devices into the stomachs of cows and networking them together, researchers hope to reduce the climate-warming farts and burps they produce. Emissions from livestock - much of which is methane released when they burp - are a serious component of global greenhouse gas emissions. But some individuals are a little more, erm, 'gassy' than others. By breeding "low methane" animals, and modifying farming practices slightly, their emissions could be lowered by up to 50 per cent, says Chris McSweeny from the CSIRO's Sustainable Agriculture Flagship in Brisbane, Australia. The problem is it's hard to measure how much cows burp while they're roaming around the paddock. So McSweeny and colleagues developed a gas-sniffing submarine that lives in a cow's stomach. Coated with a special membrane that helps it survive the harsh conditions inside, the plan is to pop them in the stomachs of whole paddocks of cows and connect them with an ad-hoc wireless network. The device stays in the stomach for weeks and measures gas concentration using infra-red sensors. A pair of wings pops out after it enters the stomach and stops it from moving beyond the rumen - the chamber in a cow or sheep's stomach where much of the gas production occurs. The trick now is figuring out how conditions in the animal's stomachs predict the volume of gasses they belch. If it works out, the creators imagine farms of networked, low-methane cows, with farmers able to monitor how gassy they are, and manage their feed in real time.